Noronha Beaches in a Glance. Fernando de Noronha is a paradise of exotic beaches, each one with an interesting history. If you want to get the best experience of spending a vacation indulging in the beauty and adventure, a coastline offers, Fernando de Noronha is the place for you. It is home to around 17 beaches and most of them are easily accessible. Visit Fernando de Noronha just for the sheer joy of living life by the beach side, it’s a great escape from land form to the water bodies to have fun, adventure, entertainment and nature by the waterfront. 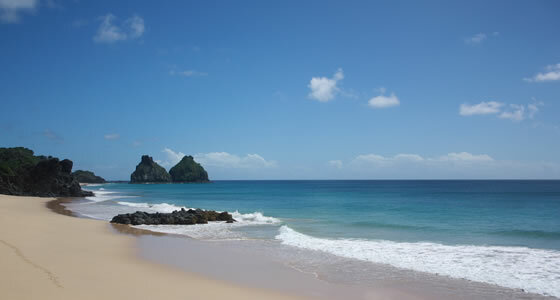 While you are at Fernando de Noronha make sure to visit all the beaches on the island, which are mostly foot-friendly. Some of the beaches of Fernando de Noronha are Baia do Sancho, Baia dos Porcos, Praia do Leao, Praia do Cachorro, Praia da conceicao, Praia do Boldro, Praia do Americano, Praia da Quixaba, Cacimba do Padre, Praia do Atalaia, Baia dos Golfinhos and Praia do Bode, Praia do Meio. Being on these beaches means a great amount of activity for you to indulge in. Some of these beaches are famous for swimming, scuba diving, surfing and a whole lot of activity. For the not so adventurous, there are beaches with combination of pebbles and sand where you can just take a stroll or sit down to watch the picture perfect landscape or choose to capture on lens the picturesque sunset. You also get to watch dolphins only at Fernando de Noronha’s Baia dos Golfinhos beach. Some beaches are particularly preserved for scuba diving to explore the underwater coral reefs and there are other beaches which are nesting grounds for aquatic birds, so you get to see the best of both worlds, underwater and above water. Since the sun shines almost throughout the year and the beaches are not so crowded, you can even choose to sunbathe on these un-spoilt beaches of Fernando de Noronha. However, Fernando de Noronha’s beaches are not just about adventure, it is also a good place for some entertainment. Most of the beaches have bars and restaurants, but not any imposing structures just places where you can grab a bite or a drink. There are quite a few beaches with bars that host beach parties not just during the day but even late into the nights. So whether by day or by night, Fernando de Noronha gives you the best of both worlds.